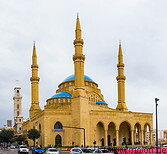 The Emir Munzer mosque on Waygand street was built by Emir Munzer Al-Tannoukhi, the Governor of Beirut between 1616 and 1633. It was damaged during the Lebanese civil war (1975-90) and restored in 2002. On Waygand street there is the Al Omari mosque. This is a former church of Saint John the Baptist, built in 1150 over the site of Roman imperial baths and converted into a mosque under the Mamluks in 1291. The Mohammad Al-Amin mosque (also known as the Blue mosque) is a Sunni mosque in El Amir Bachir street which was completed in 2008. The interior of this mosque is beautifully decorated.